For some people, board games are only bits of cardboard, wood or plastic. They’re just spaceship models or dungeon maps or dense rulebooks, a bit of fun after a strenuous week at the office. I know they’re more because they helped give me back my wife. After she was critically injured in a car crash, I watched her slowly, and in fits and starts, reclaim her speech, her movement, and her brain functionality with a broad diet of tabletop games. Massive internal trauma. She has a lacerated spleen, collapsed right lung, broken clavicle. Her lower jaw is broken into three pieces. The right cheekbone is separated from the rest of her skull. . . multiple broken bones in her chest and back. . . I struggled to process and mentally catalog the laundry list of issues the medical resident was matter-of-factly relaying to me. “But we’re not really immediately concerned with any of that at the moment,” he continued. I blinked, surprised. He told me that I needed to sign a piece of paper allowing him to cut into my wife’s head. The most important and threatening thing to her, he told me, is that she has suffered what’s called a diffuse axonal injury. It’s a traumatic brain injury, it’s severe and they needed to relieve pressure now to make sure the brain damage she’d already suffered didn’t worsen. In the deep, dark, restless hours of the night at my wife’s bedside, I realized that I could far more easily immerse myself in a game than a book for an hour or two. All of this happened after I received a phone call on July 14, 2016 that changed my life. I arrived home after work to start dinner, but before I could start, my phone rang urgently. It was University of Missouri Healthcare. “There’s been a car accident,” the operator told me, “You need to get here immediately.” They could tell me no more over the phone, so, for the next two hours, I sat quietly in a friend’s truck hurtling down the highway while my world silently crashed around me. We had only just celebrated our first year wedding anniversary. For the next two months, I lived in a hospital. My wife was unresponsive for most of the first month, somewhere between a coma and consciousness. The most frightening prospect, I knew, was who she would be when, or if, she recovered at all. As I lived in this waiting room from Hell, I desperately needed something to distract my brain from any number of emotional rabbit holes inviting my fear. But there was too much distraction. With the pings and beeps of the medical devices coupled with simple, unadulterated worry, my own ability to concentrate was shattered. Even as an avid reader, I could not rely on my mind to stick with the printed page. That’s when I thought back to board games. A year ago, after getting married and moving to a very small Missouri town for my job, my wife and I sought entertainment that did not involve us sitting, staring at a glowing screen together. 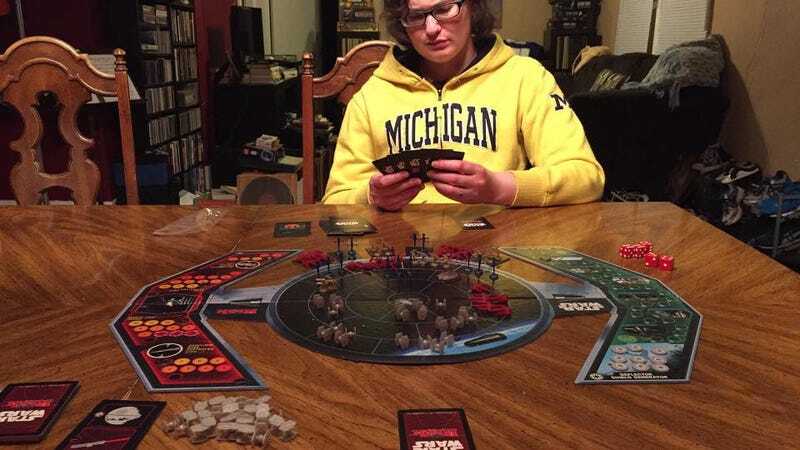 We had just started discovering games like Marvel: Legendary, Forbidden Island, and Star Wars: Rebellion when the accident occurred. During the precious few hours I would escape the hospital to eat every day, I happened upon a “Friendly Local Game Store.” The shop and its welcoming staff and community became my home away from home away from home. There, I met nerdy new friends and geeked out with them over little plastic starships. There, I also found Star Trek: Panic, the very distraction I needed. While not keen on the “panic” part of it, given the current situation, it was Star Trek and, more importantly, playable solo. In the deep, dark, restless hours of the night at my wife’s bedside, I realized that I could far more easily immerse myself in a game than a book for an hour or two. All of the sudden, my new board gaming obsession had another layer. When I wasn’t playing a game, I was learning about them through YouTube videos. Boardgamegeek.com became like Facebook. Through this, I stayed sane in an insane situation. All the while, my wife continued to improve. At the rehabilitation facility, she underwent multiple daily therapies: physical, occupational, and speech. By this time, about a month after the accident, she was recognizably a version of herself; sometimes a shadow, sometimes more, she was, nevertheless, her, and that was such a tremendous relief. Like in the main hospital, the focus in rehab was primarily on her brain injury. Her long and short-term memory were significantly damaged as were higher level “executive” functions. Her neural pathways, ripped apart in the crash, were working to rewire themselves as best they could. One day, her speech therapist brought out Connect Four and played it with her as a part of her session. That’s cool, I thought, innocently. They’re using games to help her recover. Then, something clicked. All of the sudden, my new board gaming obsession had another layer. Tic-tac-toe was fine in therapy, but my wife is an intelligent, dynamic person. I wanted to see what we could do together to facilitate her recovery and with games more our style. I started bringing Bananagrams and Tides of Time to our room where we would play when she was not resting. Frequently, I would have to guide her through her turn and offer gentle rule reminders. I found myself paying more attention to her plays than my own. But, it did not matter so much if she remembered the rules or played all that well. The process of following instructions, keeping to turn order and selecting from a finite set of actions triggered and, I think, helped rebuild thinking processes that the traumatic brain injury had affected. And, equally important, the games keep her interested and happy while doing so. Sorry, Iron Man— she’d literally talk to the character—I need to take Dead Pool this turn. After we were discharged and returned home, we gradually introduced cooperative games like Pandemic and Harry Potter: Hogwarts Battle to our gaming diet, and then, slowly, more complex games—both cooperative and competitive—such as Memoir ‘44, Euphoria and Mansions of Madness (2nd Edition). Some days, learning a new game or even returning to one we haven’t played in a while is easy. Things click into place and we’re playing almost as we did before, albeit at a slower pace. Other times, even playing familiar games, she can struggle to complete her turn. It all shows both how far we’ve come and how far we have to go. While it can be frustrating for both of us, it also serves as a good benchmark to track her progress. Early in her recovery, we returned to playing Marvel: Legendary, a game that she had loved before her accident. While she did not remember even getting it, she responded eagerly to it because of the theme. Marvel comics were a touchstone from her childhood, and that part of her memory was still intact. The game is a deck-builder: You start with a few cards offering very limited options and gradually add more complex cards to play with. In a way, my wife could develop and grow with the game. It helped that she got to pick her favorite superheroes and villains to play with. With set events on each turn, she developed a rhythm: villain, fight, recruit, discard, draw, repeat. At first, there was no strategy. She would simply recruit whichever hero she liked the best (Iron Man was and is a perennial favorite). Over the course of several weeks, once the mechanics of the game became more automatic, she vied for more optimal cards to suit her needs. Sorry, Iron Man— she’d literally talk to the character—I need to take Dead Pool this turn. To look at my wife, you would not know the hell she has been through and the cognitive fog she continues to fight. I later learned from a speech pathologist friend that there’s a checklist of cognitive traits treated in cases such as my wife’s, and gaming checks off many (if not all) of the relevant boxes: expression (verbal and tactile), auditory and reading comprehension, attention/concentration, initiation, mental processing, reasoning and memory. Not only does gaming give much-needed practice in all these areas, it also actively assists her in rebuilding how to think. Weeks into her recovery. I have observed my wife play increasingly difficult and complex games at higher and higher levels of function. Brain injuries are invisible afflictions. To look at my wife, you would not know the hell she has been through and the cognitive fog she continues to fight. Gaming is a safe space where she can exercise herself mentally and behaviorally. She still frequently experiences “brain burn,” but that, too, is improving (both in games and in daily living). As she continues to improve, she is able to handle increasingly difficult games. Her current favorite game is a toss up between Terraforming Mars and Viticulture. Today, almost a year later, we’re fortunate to be a part of a weekly game group full of people supportive of my wife and her recovery. The group, run by Jamey Stegmaier of Stonemaier Games, has been welcoming to both of us, gently assisting my wife as needed during play, and we’ve even had the opportunity to play test new games and expansions. Giving critical feedback has enabled my wife to continue to stretch her brain while also empowering her, and I’m grateful to Jamey for being so open to us. She is a far cry from how she was months, weeks, even days ago, but we still have a long way to go. So, we will continue fighting World War II and Voldemort. We will keep building farms and hunting Dracula. We will keep playing for her (and my) health, sanity, and enjoyment because I’m convinced it has helped save both of our lives as we know them. After all, they’re not only games. Jeffrey Spenner is a musician living in Missouri with his wife and five (yes, five) cats. He contributes to the site The Game Blob (www.thegameblob.com) where he focuses on his wife’s “Board Game Therapy” as she recovers from a severe brain injury.